Thank you to all our members who attended our AGM on April 9. We welcome you to our new board of directors for 2017. We would like to give a special thank you to our board members who have retired this year after many years of service and dedication to Waterloo Region Football. Your contributions to our board meetings and association will be missed! 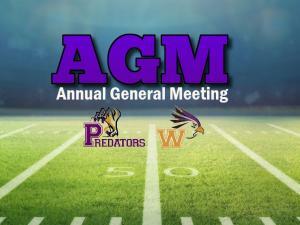 Included on the AGM agenda was a motion to rebrand Warhawks to Predators. Our members voted and the motion was passed. We believe the streamlining to one name makes sense both in financial terms and brand recognition. Coaching Director, Summer Director and Fall Director will be announced at a later date. Thank you to everyone for volunteering to support Waterloo Region Football.